Every year, over eight million people visit the region of the Black Forest. However, only ten per cent of the visitors are young people. In the minds of this target group, the image of the Black Forest is dominated by dusty souvenir shops, Black Forest cake and the presence of the elderly. 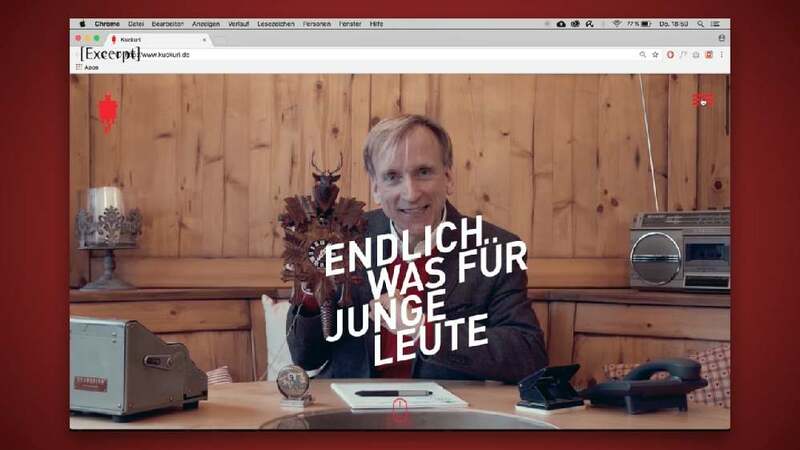 The image campaign “Endlich was für junge Leute” (Finally something for the youth) aims at a shift in perception to increase the appeal of the Black Forest region as an attractive destination for young people. Taking a proactive approach, the image campaign aims at appealing to a smartphone-savvy target group through attention-grabbing events in public spaces as well as on the Internet. Brought across, for example, via the new cuckoo clock “Kuckuri”, which features a camera, a Bluetooth box and speech recognition, and provides Wi-Fi in public places or at festivals. Alongside a variety of giveaways such as earplugs or condoms, the fictional character of visionary mayor Heinz-Dieter von Tann has been created to breathe life into the campaign. Setting out on a humoristic expedition to check whether the Black Forest is dusty at all, this character discovers daring trend sports, combining tradition with the digital touchpoints of the young generation. The image campaign for the Black Forest region is wonderfully light-footed. Typical objects such as the cuckoo clock have received a contemporary interpretation with a wink in the eye, and smart technologies are effectively integrated and staged to meet the preferences of a new target group. Overall, the campaign represents a well-executed promotion that piques curiosity and lets the region stand out as a pleasure to discover.